Flash Sale: Amanda Catherine Designs! I’m not really the type of person to buy things from Flash sale sites. I browse, I add things to my cart, but I never actually go through with it. However, ever since we posted about Amanda Catherine Designs' artwork, I’ve been secretly watching her sales go up and up (so excited for her! ), and wondering which piece I should invest a little cashola in. 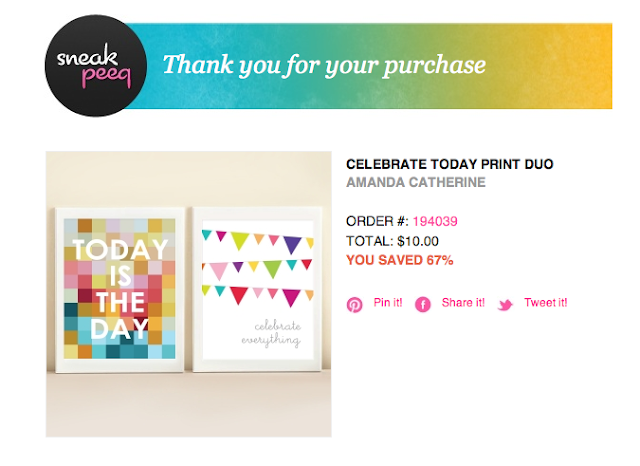 Well, today Amanda Catherine Designs is on the new Sneakpeeq and I scored two of her pieces for $10! I’m going to hang these babies in the sewing room. Love the colors and messages! Also, she’s the sweetest person, so go check her work out!